Hogarth’s Pest Control specializes in earwig removal. Earwigs are beetle-like, short-winged, fast moving insects. They are about one-half to one inch in length and dark brown in color. Earwigs have a pair of pincer-like appendages at the tip of their abdomen. These insects usually hide in cracks, crevices, under bark or in similar places during the day, but are active foragers at night. They are usually scavengers in their feeding habits, feasting on on plants, fungi, leaves, fruit and larger insects. 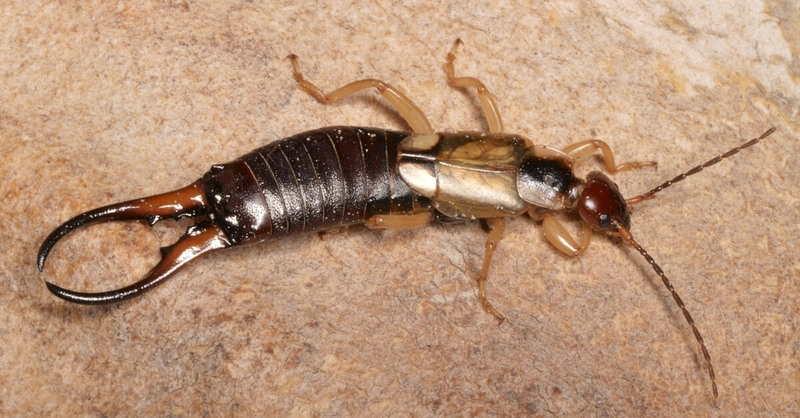 The name earwig comes from an old superstition that these insects enter human ears and work their way into the brain, where they attach and eventually drive their host to madness and/or death. This fairytale has no foundation in reality and is entirely false, though it does make a scary story for children! Earwigs cause no physical harm to humans, however certain species have scent glands from which they can squirt a foul-smelling liquid. This is probably a means of self-protection; however, it makes them very unpleasant when crushed. If you have spotted earwigs marching about your home, give us a call. We specialize in the eradication of these types of crawling insects as well as a vast array of others. We are available 24/7 at (800) 264-6161!